The day of my departure, the 18th of February, had come. After taking a bath, I visited Mr. Hornich in his factory. He was very moved and gave me a bottle of Cognac. Also the wine merchant Kurzenberger, the virtuous man from Württemberg [Region in southern Germany], where we allowed ourselves a parting drink, handed me a bottle of Nordhäuser [a Korn liquor], which was a highly welcomed gift for the journey at sea. At 10 o’ clock I went to New York, accompanied by my friend Rosenbaum, where we ate lunch at the “Postkeller”, which was followed by a small beer journey [pub crawl]. We arrived early at the pier in Hoboken. On the ramp to the steamboat, I was suddenly stopped by a “Show your tickets, please”. In the same moment, I recognize my old friend Hornich, who, as he said, wanted to take the last chance to greet me. We all went downstairs into the Salon, where we celebrated with a number of bottles of dark beer, one last time, farewell. Shortly before 2 my two friends left and shouted a hearty farewell to me from the pier. 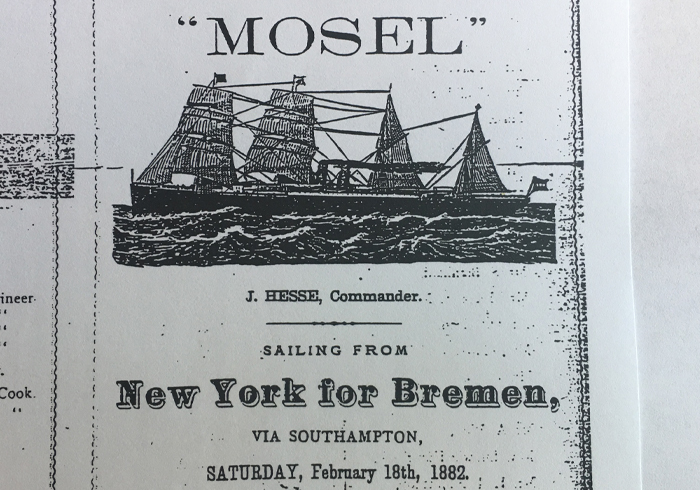 Exactly at 2 pm the “Mosel” left the pier and we went down the wide Hudson through the big harbour of New York and in to the Ocean, at nice weather. The next day is a sunday. The sea is rough, the ship is swaying. In the afternoon, we get into strong snow flurry. I stay as long as possible on deck, but I already feel sea sick, whereto the plenty farewell celebrations may have contributed. On the 20th of February the weather is clear and I appear at the dinner today (for the first time) and I notice four sisters across the table who belong to the Franciscan order. I find out, that they want to travel to Aachen as delegates. After dinner, I rest a little bot in the smoking cabin of the first cabin; I was alone, a spiral staircase led down to the dining room of the first cabin. From there I hear the captain say: “We will experience a strong storm during these coming days”. He explained to the scared ladies: “This must be the case, because we have four merciful sisters and one mormon aboard.” – “What? 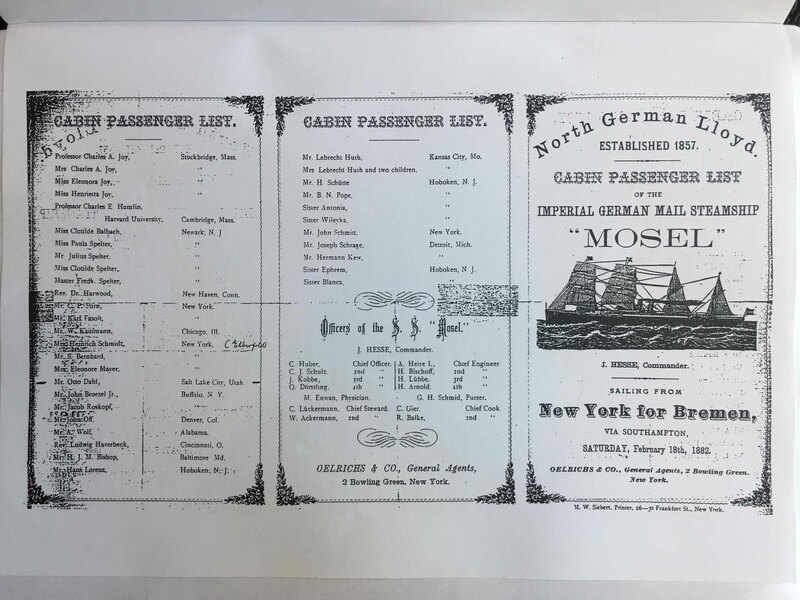 A mormon?” – “Certainly”, said the captain and gave them the passenger list, which was distributed to the travellers today. Thereupon, I heard him say my name very clearly: “Mr. 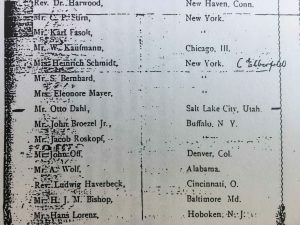 Otto Dahl from Salt Lake City”. Temporarily, I was confused, until I received the passenger list one hour later and I saw my entry as the captain had read it. Now I was marked as a mormon. Besides, I had company of the four sisters and an older lady at the table, whereas one other table was occupied by men only. The curiosity of the travellers was grand, so one man, whom I shared the cabin with, was ordered to interrogate me. He introduced himself as a wine merchant from New York namend Schmidt, and said that since he was married, I could tell him unabashed about the customs and traditions of the mormons. While I was resting on the upper bed in the cabin during the afternoon, I told the wine merchant, who was in the lower bed, the greates tales about murder. Sometimes I had to close the curtain, so that the attentive listener would not see through the mirror hanging on the opposite wall, how much I had to stiftle my laughter. He took my descriptions about the state of things in Utah with a faithful heart. So I swindled about having four wifes in the beautiful land of the Mormons, however, one had recently “incured” [I think he means died]. But since every mormon has to own a minimum of four wifes, I had the choice of either replace her soon or to leave the country upon paying 100 dollars and a new suit. In the latter choice, I had the opportunity to return within one year with a fourth wife. This was the moment I was at. During the next two days, I did not appear at dinner, as I had become very sick again due to a very rough sea. This gave Schmidt the opportunity to tell my stories to everyone and to process it thoroughly. When I returned to the table, I was watched carefully, which did not escape my attention. In the afternoon I saw the four sisters, dressed in black as always, sitting on a bench in the staircase which was positioned transverse to the ship. One of the sisters was sitting on one end of the bench, separated from the others. Since it was raining, I sat down with them in order to read. Immediately, the ship lifted on the right side so much that the three sisters slid with a sharp jerk towards me and pushed me tight against the fourth sister. In this aweful situation we were discovered by the wine merchant, who was climbind the stairs holding on to the railing, to his great astonishment. I had told him the night before that one of the sisters wanted to convert to Mormonism, which must have seemed completely believably and a fact to him now, seeing the presented spectacle. He had not seen the sudden jerk, so that the must have interpreted the close get-together of the five devoted people as a success of my attempts to convert the sisters. The people aboard were informed about this very soon and my reputation as a Mormon was reinforced. 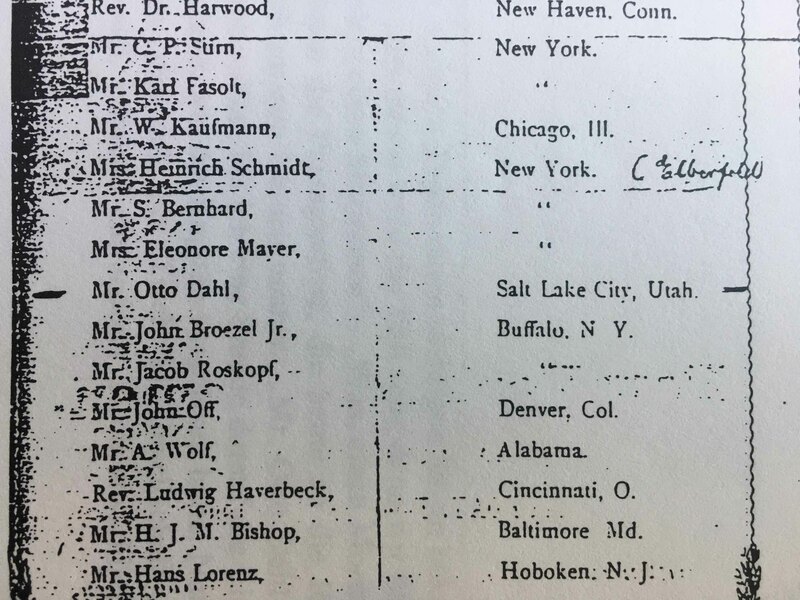 At table, I talked alot with the sisters to be polite, alike with the older lady, who came from Elberfeld [neighbour town of Barmen], and had spend half a year in New York at her married daughter, which is why she wanted to be called Mrs. Schmidt. During the conversation, we arranged to travel together from Bremen to Wuppertal. However, it should not happen. During the evenings, we enjoyed musical performances by the waiters (still called Stewards), at which they sometimes had to take on a funny position to avoid falling, because the ship was rolling so much. During several days we have a rough sea, the ship rolls heavily, which leads to hilarious scenes during the meals. Several nights I spend on the couch, where I sleep much better because it is positioned on the side wall of the ship, whereas the bed my head and feet would rise by turns. In the night of the 27th to the 28th of February, a person who had become lunatic and had hung himself was pushed overboard in a bag and weighted with stones, finding a wet grave in the waves. The weather is mostly cloudy and rainy, which is why the observation and the determination of our exact geographical position is difficult, which almost led to doom. On the 28th of February, a misty day – we were just finished with lunch – we saw a man running to the first cabin to the captain with a message, and immediately after the captain ran to the bridge and turned the ship in a 90 degree turn to south. Suddenly, we see on our left – in our former direction of travel – a brown and jagged cliffs close to our eyes rising from the water in the mist – we had headed straight towards them. We had escaped the great danger through the agressive change of course. The cliffs were the outmost rock spurs of the Scilly Islands, on whose rocky cliffs the “Schiller” and many other ships had found their sinking. Soon we see the lighthouse on Bishop Rock, then we pass the island St. Agnes on the right, which is also equipped with a light tower. In the evening, the weather clears, and we see alot of other steamships and sailships. Early on the 1st of March we pass the Needles, the western rock spurs of the Isle of Wight. At last the pilot comes aboard which we had expected yesterday, who will bring us to Southampton. In the english harbour, the post is unloaded and loaded and many travellers disembark here, while two pilots come aboard, one English, one German. The first one will lead us out of the harbour and into the North Sea, while the second will guide us into the mouth of the river Weser and to Bremerhaven. We leave Southampton at clear and nice weather at 9 o’clock in the morning travel along the smooth chalk rocks of the english coast. Between 5 and 6 o’clock we pass the city Dover, whose two lighthouses blinkt to us. Soon we enter the North Sea with higher speed and a clear full moon. The next morning brings us some rain, in the afternoon it is clear again and the sea is calm. At 4 o’clock we pass the lighthouse of Wangeroog to our right and approach the mouth of the river Weser. 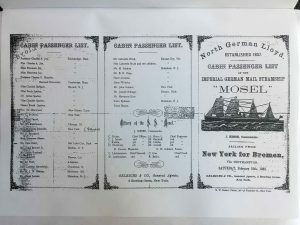 At 7 o’clock we reach Bremerhaven, where we transfer onto a river steamship which seems tiny to us, and go to the hall of the North German Lloyd. Here, the brave captain Hesse greets us goodbye, while we board a special train to Bremen. During the ride, I am searching for Mrs. Schmidt, in order to tell her that the next train to Wuppertal departs at 1:10 at night from Bremen. I receive the surprising and embarrassing message that she had decided differently and wants to stay the night in Bremen. Then I finally notice the wine merchant from New York next to her and suddenly it was clear to me: The man had taken all my swindle of the four mormon wifes etc. for serious and apparently had warned his travelling companion about me – well, I could bear it. When I returned to my compartment, I had to laugh about it. I departed Bremen on time at 1:10 am and reached, after a 6 hour train ride, shortly past 7 am Barmen, where I was welcomed by my friend Homberg, whom I had informed via telegramm. At half past 7, I opened, with the key that had survived the journey to America, the house of my parents and surprised my clueless mother in the living room. To her astonished question “Where are you coming from?” I replied “From America!” and sat down with her at the breakfast table. Exactly 8 years later, during the same hour on the 3rd of March 1890, she ended a life full of work and sorrows.